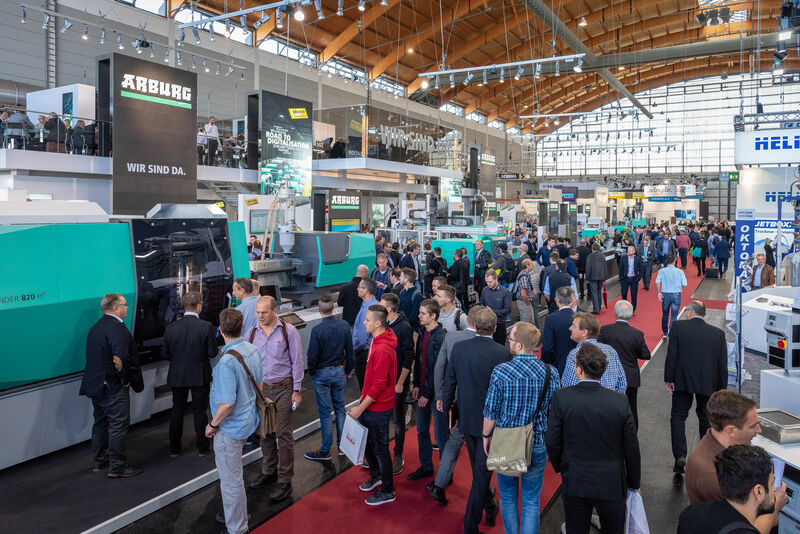 The Fakuma international trade fair for plastics processing, which is recognized as an industry and technology barometer, is verifying – in time-lapse mode – how quickly the plastics industry is evolving. The technical event with an emphasis on injection moulding continuously presents solutions offered by manufacturers, distributors and system integrators for mastering current and future challenges. Based on the great success of the event held in 2018 (1933 exhibitors from 40 countries gathered on Lake Constance for the first time ever), trade fair promoters P.E. Schall GmbH & Co. KG are already planning for increased internationalism on all available floor space in 2020. “For years now we’ve been occupying all available exhibition floor space at the modern Friedrichshafen Exhibition Centre, which is unfortunately only able to offer 85,000 square metres,” explains Bettina Schall, qualified business administrator and managing director of the event promoters. The fact that the manufacturers of plastics processing machines anticipate further growth for the eighth year in a row is impressively underscored by the technological know-how of the manufacturers and distributors. The injection moulders unexcitedly reported on a certain amount of stabilisation with regard to order receipts at their business press conferences, but in light of longer lead-times due to bottlenecks for purchased parts, lack of personnel and insufficient production capacity, the current market slowdown is not at all inopportune for many companies. Within this context, Dr. Christoph Steger, CSO of the Engel Group in Schwertberg, Austria, and member of the Fakuma exhibitor advisory committee, spoke of a certain lateral motion which is taking place at a thus far unparalleled level. Accordingly, the somewhat cooled-down demand didn’t spoil the good mood of any of the participating companies during the course of Fakuma 2018 – especially in light of the fact that the plastics industry is still booming despite gloomy Brexit and stock market predictions, and even though the automobile industry is pushing back numerous projects due to the diesel crisis. Roughly 47,650 expert visitors from 126 countries travelled to Lake Constants in 2018. Although the figures fell just short of the record-breaking visitor numbers achieved at the anniversary event, the promoter and the exhibitors were nevertheless quite satisfied because visitor quality was very good. Numerous exhibitors praised Fakuma as a “genuine working event”, and as the technical trade fair for established practitioners that’s consistently aligned to the process sequence in the field of plastics processing. “Nowhere else is it possible to explore conceptions, projects and visions with customers in a more concrete fashion, which is why the industry meet clearly has the status of an order placing trade fair for us as exhibitors,” explained an exhibiting injection moulder in order to put things in a nutshell. Beyond this, digitalisation and interconnectivity, as well as ongoing process integration and system solutions for machines and peripherals, necessitate a continuous dialogue between machine manufacturers and plastic processors. As a logical consequence, globalisation, digitalisation and circular economy were the predominating issues at Fakuma. Sensibly interlacing products and services in the field of production technology with IT in order to conserve resources, become more transparent and flexible, and to work more efficiently, was once the targeted goal of the Industry 4.0 strategy. The fact that manufacturers of plastics processing machines have meanwhile evolved significantly in this respect and now offer far-reaching digitalisation and networking of their machines was consistently apparent at Fakuma. Thanks to intelligent assistance systems and wide-ranging vertical integration – from ERP all the way down to the inner workings of the machine – self-optimising solutions are more than just a vision in the meantime. For certain tasks they’ve already become reality and visitors marvelled at them during Fakuma 2018, or expressed in the other way round: networking has arrived for plastics processors. “But there’s still a lot of ground to cover until wide-spread networking has been implemented,” says an insider, “and the direction things will actually take with Industry 4.0, IoT and the digital transformation will probably first become apparent at Fakuma 2020. The fact that the currently rather poor image of plastics shared by the general public – which has resulted from the discussion of the contamination of the world’s oceans with plastic waste – is resulting in a sensitisation of the industry sector, is seen by Bettina Schall as an opportunity. Thorsten Ratzmann, CEO at Pöppelmann, expressed it even more bluntly in his statement: “As a material which can be processed in numerous ways, plastic has fallen into disrepute in the meantime and the plastics industry has a serious reputation problem.” For many people – so it would appear at first glance – plastic is “evil” and its use must be reduced in the future! This may indeed be an enticing goal, but in reality it contradicts the truth – a fact which was demonstrated at Fakuma 2018. Plastic must and will always be made use of for a more sustainable future. The term circular economy has thus long since established itself in the plastics industry. And the question is no longer “whether or not,” but rather “how”. The fact that circular economy has arrived in the field of plastics machinery manufacturing was more apparent than ever on Lake Constance. Especially since higher recycling quotas and improved efficiency for waste management can only be dealt with at the global level by means of an open dialogue. Plastics processors will only use recyclates for the production of plastic products to an ever greater extent if reliable material quality is available in adequate quantities. However, this is only possible if enough recyclable waste plastic is collected. It became apparent at Fakuma in Friedrichshafen that the plastics industry will have to do much more itself in the future: “If we ever want to achieve the goal of closed-loop systems, we’ll need to unite the forces of all partners involved in the value creation chain – including the final consumer. We have to work mutually and resolutely on all of the decisive steps within the loop including production and use of the products, as well as disposal,” explained a recycling expert in Friedrichshafen. There’s really nothing to add to this, because the mega-topic will remain on the agenda in any case. The 27th Fakuma will take place in Friedrichshafen from the 13th through the 17th of October, 2020.